Allows you to immutably preserve mailbox content to meet long term preservation and eDiscovery requirements. When a mailbox is placed on Litigation Hold, all mailbox content is preserved indefinitely. Is integrated with In-Place eDiscovery. Allows you to search and preserve all or selected based on time or/and query parameters. 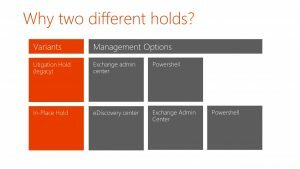 You can use either hold feature to preserve mailbox data in Exchange 2013 and Exchange Online, based on your preservation needs. Here are some scenarios to help you choose between the two holds. Preserve all items in a mailbox Yes Yes. To preserve all items, don’t specify any query parameters. Preserve all items in a mailbox for a specific duration Yes. Specify the LitigationHoldDurationparameter for the mailbox using the Shell. Yes. Create a time-based In-Place Hold. Specify the duration in the In-Place Hold settings in EAC orItemHoldDuration parameter from the Shell. Preserve items matching query parameters No. Litigation Hold preserves all items. Yes. Create a query-based In-Place Hold. Specify query parameters such as start date, end date, sender, recipients and keywords. Specify types of items to preserve (such as email, calendar, notes) No. You can use the EAC or the MessageTypesparameter from the Shell. Specify hold settings for members of a distribution group Yes. Use the Get-DistributionGroupMembercmdlet in the Shell to pipe distribution group members to theSet-Mailbox cmdlet.1 Yes. Max users on hold No. Litigation Hold is a mailbox parameter. No maximum limits apply. You can use the Shell to quickly place all users in an organization on hold. You can specify a maximum of 10,000 users per In-Place Hold object. To place additional users on hold, you must create another hold. Place multiple holds on a mailbox No Yes. You can place a user on multiple In-Place Holds, for example when a user is subject to multiple investigations or legal cases. 1 Distribution group is expanded when you run the command. Future changes to the group require running the command again. 2 Distribution groups are expanded only when you create or refresh the In-Place Hold. Future changes to the group require refreshing the search object. 3 Inactive mailboxes is an Exchange Online feature. The linked documentation is being updated to clarify you can also use Litigation Hold to make a mailbox inactive.